The passport history of the German Democratic Republic (GDR) is a brief one, but most interesting. 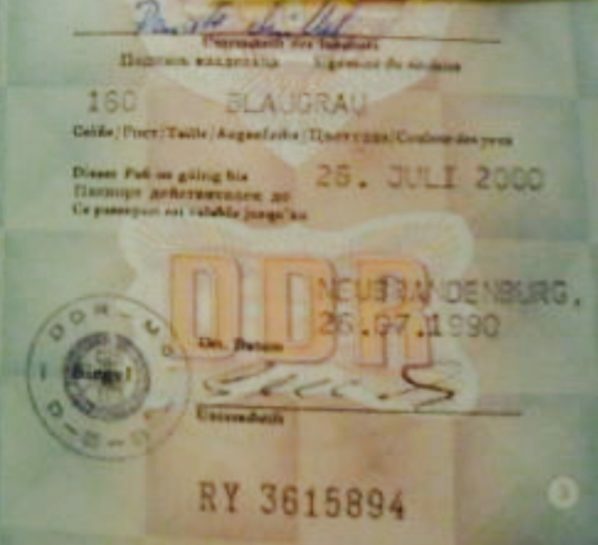 While the GDR released it’s first passport act only in 1955, six years after it’s foundation, the very last passports must have been issued mid 1990. The BERLIN WALL was already open and the unification was on it’s brink. While I have seen many passports issued in January and February 1990, a few in March 1990 but so far never later. But this one was issued on July 26, 1990 around three months before the German unification. So far I would say it is indeed one of the very last issues. If you should have knowledge of even later issued passports I would be glad if you let me know. In meantime I could add the diplomatic passport of Günter Mittag (member of parliament, secretary of the Socialist Unity Party of Germany (SED), and a central figure in the German planned economy) to my collection.